Hurricane Irma, one of the strongest Atlantic hurricanes ever recorded, started slamming the southeastern Caribbean islands early Wednesday with devastating winds, heavy rains, and catastrophic storm surges. As of Saturday morning, the Category 3 storm's eye was 175 miles southeast of Key West, Florida with maximum sustained winds of 125 mph. 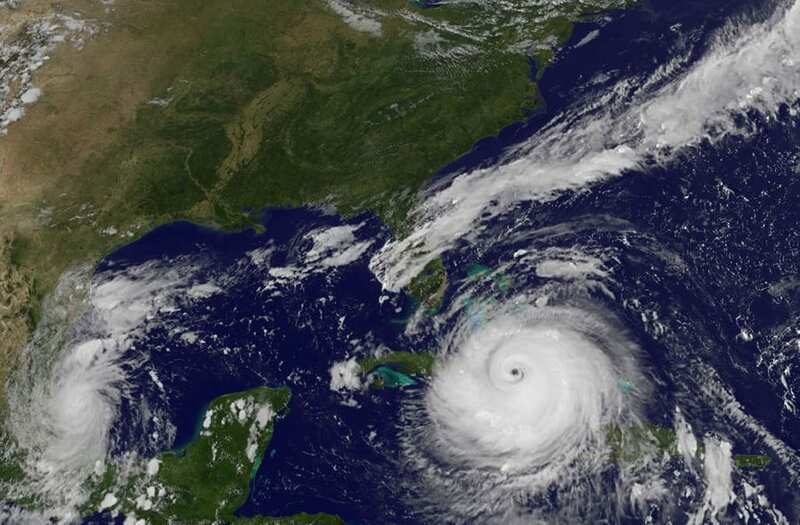 The National Hurricane Center said the hurricane was cruising west at 9 mph. The NHC reports that Irma is pounding Cuba. Its center is expected to turn northwest and wind up near the Florida Keys by Sunday morning, though the state is already seeing strong winds. "The threat of catastrophic storm surge flooding is highest along the southwest coast of Florida, where 10 to 15 feet of inundation above ground level is expected," the NHC wrote on Saturday. "This is a life-threatening situation and everyone in these areas should immediately follow any evacuation instructions from local officials." The National Weather Service's latest forecast puts the entire state of Florida in the storm's crosshairs, with Irma most likely making landfall on Sunday morning. The storm is expected to travel up the western side of the peninsula on Sunday night and Monday, then head for Georgia and Alabama on Tuesday. Hurricane warnings are in effect around much of the Florida coast, from Fernandina Beach south around the peninsula to the Aucilla River. The Florida Keys, Lake Okeechobee, Florida Bay, and parts of Cuba and the Bahamas are also under hurricane warnings. Storm-surge warnings are in effect from the Volusia/Brevard County line south around the peninsula to the Suwanee River, as well as in the Florida Keys and Tampa Bay. A hurricane watch is in place along parts of Florida's coasts, north of Fernandina Beach to Edisto Beach, and west of the Aucilla River to Indian Pass. The Cuban provinces of Holguin and Las Tunas are also still under watch. While Hurricane Harvey brought devastating floods late last month, Irma's biggest threat is its strong winds and storm surge. Irma is now a Category 3 storm on the Saffir-Simpson scale, which measures a hurricane's strength based on its wind speeds. The scale goes up to 5, but if it had been extended to classify Irma's highest sustained wind speeds of 185 mph, the storm could have been considered Category 6 at one point, though that's not an official designation. 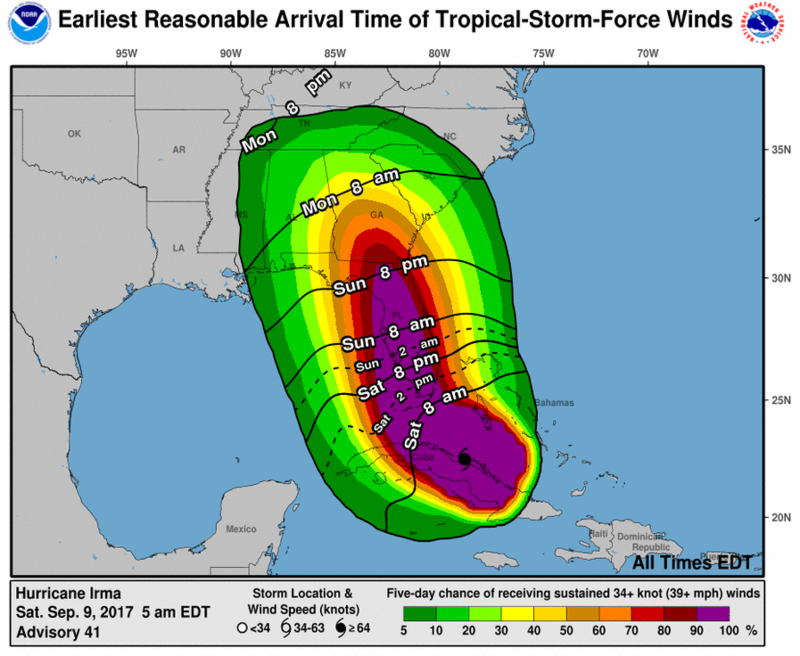 Part of what makes this storm so dangerous is its sheer size — hurricane-force winds extend up to 70 miles from Irma's center, and tropical-storm-force winds extend up to 195 miles, according to the NHC. Florida's peninsula is only about 140 miles across at its widest, so Irma could engulf the entire state with its powerful winds. Irma's storm surge — the quick rise in water caused by a hurricane's strong winds — and wave height could be devastating. The National Hurricane Center suggests that if Irma hits Florida at high tide, water levels there could rise 10 to 15 feet above ground from Cape Sable to Captiva. Parts of the Bahamas may see water levels rise 20 feet above a typical high tide, though forecasts differ greatly among regions. The NHC expects between 10 and 20 inches of rain in the Florida Keys and much of the state's peninsula, with isolated areas getting up to 25. Cuba could see 10 to 15 inches, with some areas getting up to 20. The rains could cause "life-threatening" flash flooding and mudslides, the NHC says. 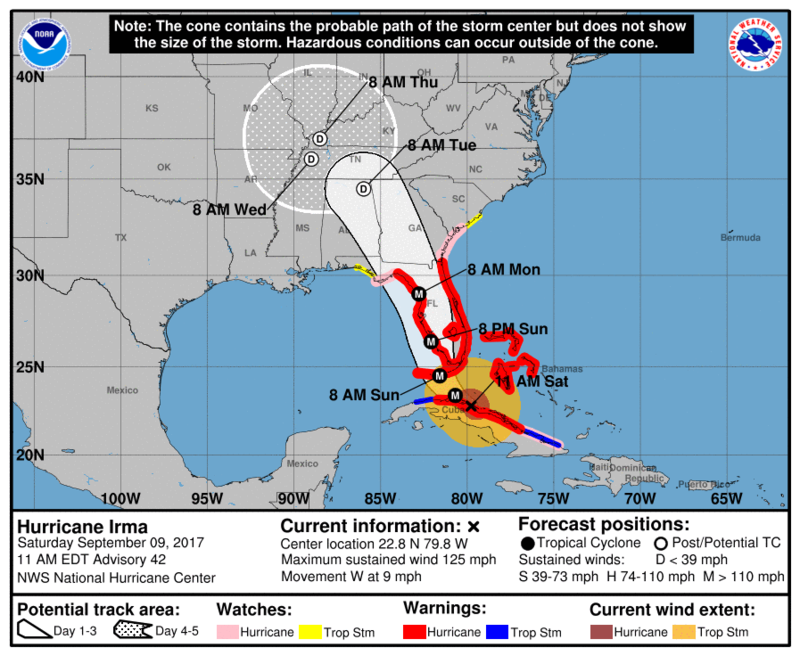 The NHC is forecasting Irma will make landfall in Florida as a catastrophic hurricane on Sunday, and forecasters advise residents to heed the advice of local officials and get ready if they are in the projected path of the storm. As of Saturday morning, nearly 7 million people have been ordered to evacuate. The Florida Keys and the southern tip of the state are the most likely to see the worst effects of the storm before Irma starts to weaken slowly after making landfall. 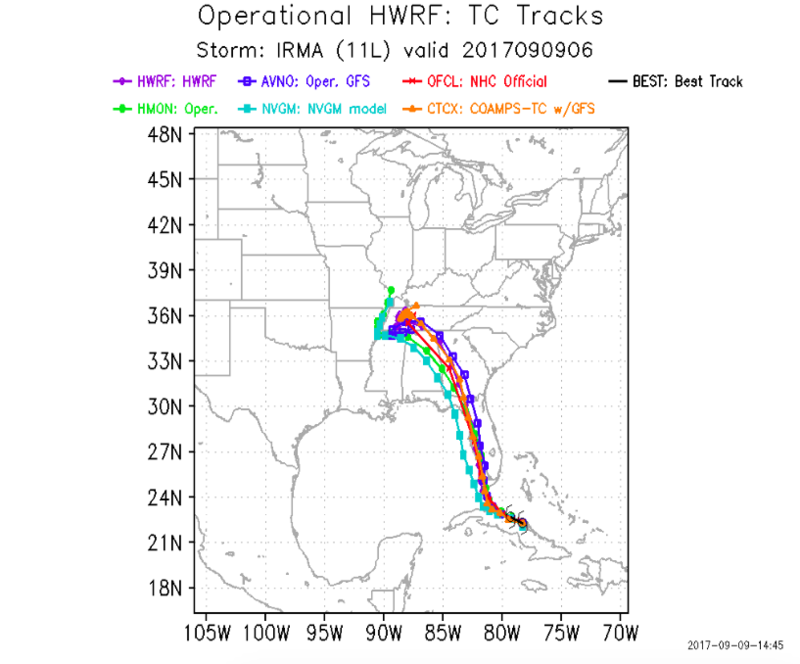 Forecasters aren't positive yet how Irma will move up the East Coast, though the models are indicating the storm could hit Georgia, Alabama, Tennessee, and parts of South Carolina and Kentucky. "Since Irma is a large hurricane, [forecast] users are reminded to not focus on the exact forecast track since tropical-storm and hurricane-force winds and life-threatening storm surge extend far from the center," Daniel Brown, a senior hurricane specialist at the NHC, wrote on Tuesday. "Everyone in hurricane-prone areas should ensure that they have their hurricane plan in place."